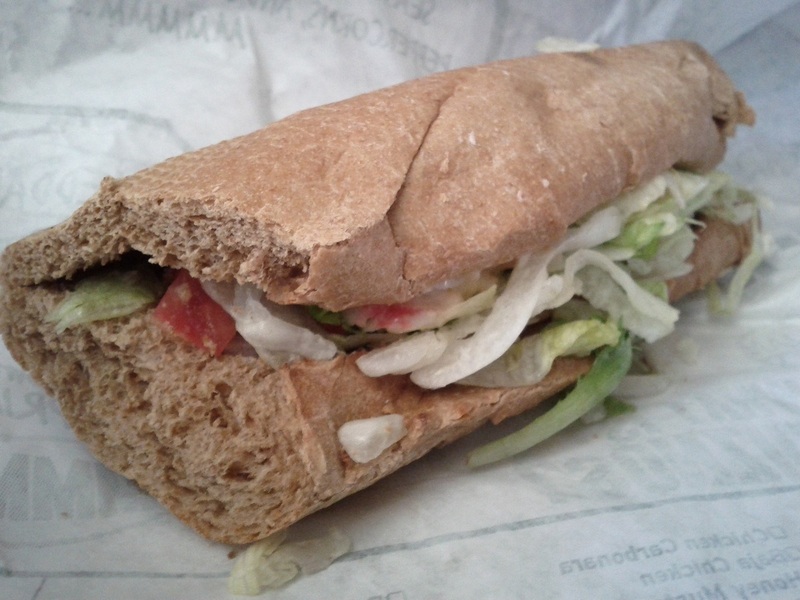 Though I ate the above sandwich, I had not originally intended to talk about it. I ate it because there’s always the chance that a franchise chain will put out something surprising, and I wasn’t going to talk about it because there’s a much, much (much) better chance they won’t. On Sandwiches is an enterprise of enthusiasm, not one of criticism, and so I avoid talking about many of the disappointing sandwiches I eat. But someone on Twitter requested it, and so here we are. I’m not one for “fast food doesn’t look like it does in the ads,” as it strikes me as fruit hanging so low one might trip over it. But the disparity between those two images is too wide for me to ignore. Where do they get the bread used in the photo, I wonder, and do the tell the proprietor of that enterprise what they’re doing with it? I imagine some baker catching sight of the ad one day, recognizing his own bread and weeping softly. Anyway. To the matter at hand, this sandwich is no good. There is some lobster and seafood salad, but it’s as bland as such a thing can get. Far from the chunks present in the promo photo, It’s minced beyond recognition. That’s not my preferred state, but it can still make for a good sandwich. That wasn’t the case here, of course. What’s most irritating about a case like this is that it wouldn’t take much to save the effort. If your seafood salad lacks flavor, a little lemon juice will boost things up. Fresh cracked black pepper, seemingly included in the promo version, would have gone a very long way here. 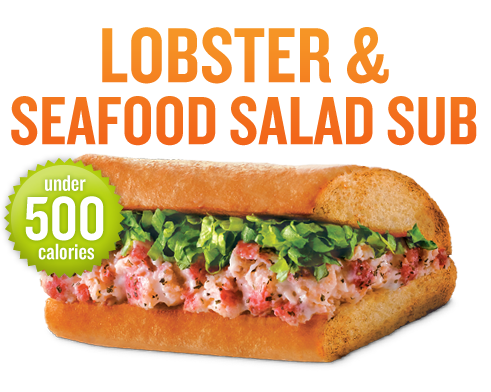 (Pepper is available at nearly every sandwich franchise, but it is never fresh cracked. The rate of aromatic decay in a peppercorn is one of nature’s great injustices, but it is what it is.) 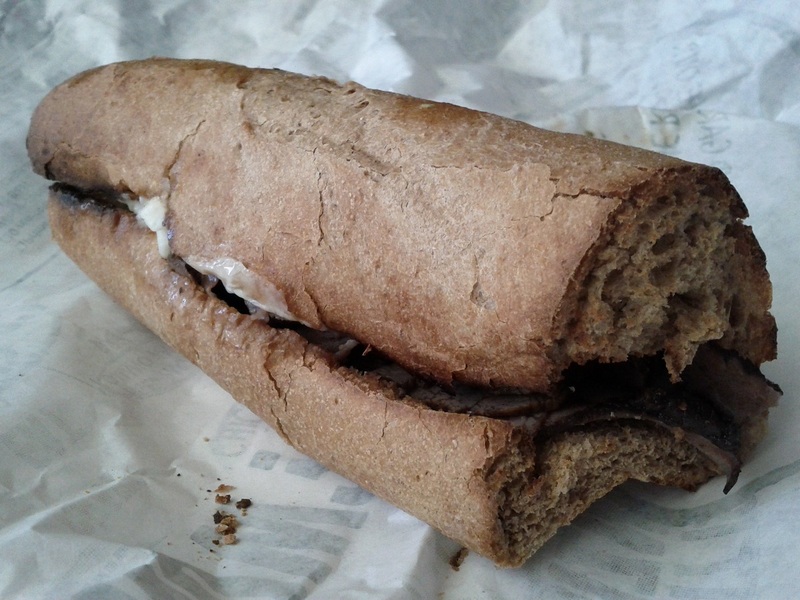 So despite that a halfway decent sandwich was well within reach, Quiznos instead delivers the above. Tragic. In case the seafood might strike you as some kind of aberration, the above is the Prime Rib Peppercorn sandwich. It is exactly as good as it looks. This entry was posted in Sandwich Reviews, Slummin' It and tagged Fish, Reviews by Pete, Sandwiches I Have Eaten, Slummin It by Pete. Bookmark the permalink. I tried this sandwich after seeing it here, you are right it sucked.